Two weeks ago I did an interview with Fernanda Araujo for her Masters in Applied Disability Studies. This week she had a few follow up questions. 1. Can you start by telling me something of what it is like to live with disability every day? For the most part, having a disability isn’t something I really think about. I don’t wake up every morning and think, "Damn, I have cerebral palsy yet again!" I go about my day, doing what I do, the way in which I do it. At times I hit a bump or barrier and need to find how to work around it. But, really, I don’t know what it is like to live without a significant physical disability. Living with a disability daily is how life is and I deal with it, day by day. 2. What are some of the main challenges you face? What strategies do you use to meet such challenges? An alphabet card to spell out words for people. During my university years, that card became my security blanket. I didn’t live my apartment without it. Notes that I typed ahead of time. I dubbed them my talking papers. Now I use text-to-speech software and the voice of Kate to give speeches and presentations. I have found having a variety of strategies to be the key. That way I have a choice of which to use, depending upon the situation. 3. Do you ever feel marginalized? Disadvantaged? I felt the most marginalized or disadvantaged was when I was searching for a job. Because of my disability, I can not answer phones or type at 60wpm – job requirements for many entry level positions. Employers seemed unable or unwilling to look beyond my cerebral palsy with its jerky movements and strained speech to see my abilities, skills and passions. Employers were unwilling to take a chance in hiring me. Being excluded from the labour force, after working as hard as my peers in school and university, I felt marginalized by society. However, because I was excluded from the labour force in one sense, I have found other ways to put my abilities, skills and passions to use in rewarding ways. I imagine I am happier and more fulfilled doing what I am nowadays with blogging and such than I would have been in a 9 to 5 type job. I am confident that the income will come. 4. What have you learned from your disability? How has it made you a better person? Without knowing the type of person I would have been had I not had a disability, I think my cerebral palsy has magnified my determination, persistence and creativity. Having a disability has taught me to be open and accepting of differences and to try to accommodate those differences. It has taught me to flexible and to find possible solutions. I am continually learning patience and understanding. 5. How do other people look at your disability? This is a difficult question to answer because I rather not speak for other people. Some see my disability first; others see beyond my cerebral palsy to see me. 6. What about your close relationships with people? In what ways do they treat you differently and in what ways does disability make no difference to them? My close friends and my family see beyond my disability and accept me for who I am. They willingly make allowances when needed and they know when I can do things myself (sometimes with a gentle reminder). They expect no less from me simply because I have a disability. 7. Are there other aspects of disability that are important to you? Tightly intertwined with disability is the need for accessibility in every aspect of life: housing, education, transportation, shopping, employment, banking, websites, health services, recreation, entertainment, sidewalks… Every where. It is that accessibility that enables me to live my life as independently as possible. 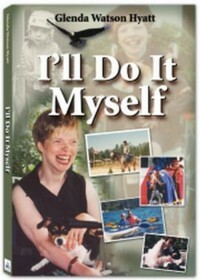 Accessibility enables me to say, "I’ll do it myself." Hope: Essential for the Human Spirit, But What Exactly Is It? It’s really really interesting to see what challenges your disability presents, and how you get around them. I’m also glad you have the voice of Kate now… the ABC cards sound a bit frustrating!